Dosas in a San Francisco street corner? 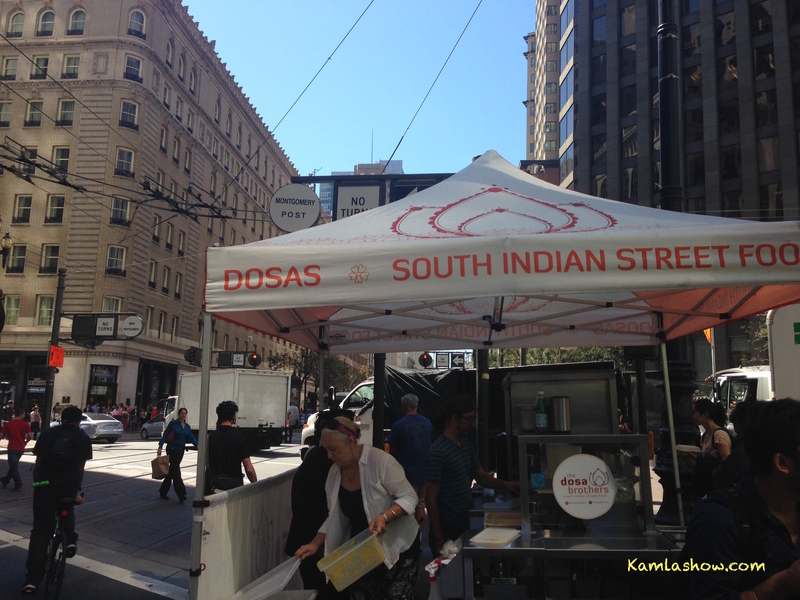 South India Street Food in the heart of San Francisco? I walk by Market and Montogomery quite often and how in heaven’s name did I fail to see this? Who started Dosa Brothers? These were the thoughts flitting through my mind as I impatiently waited for the traffic light to turn green. My eyes were fixated on that orange sign, and at the man, who was flipping dosas. 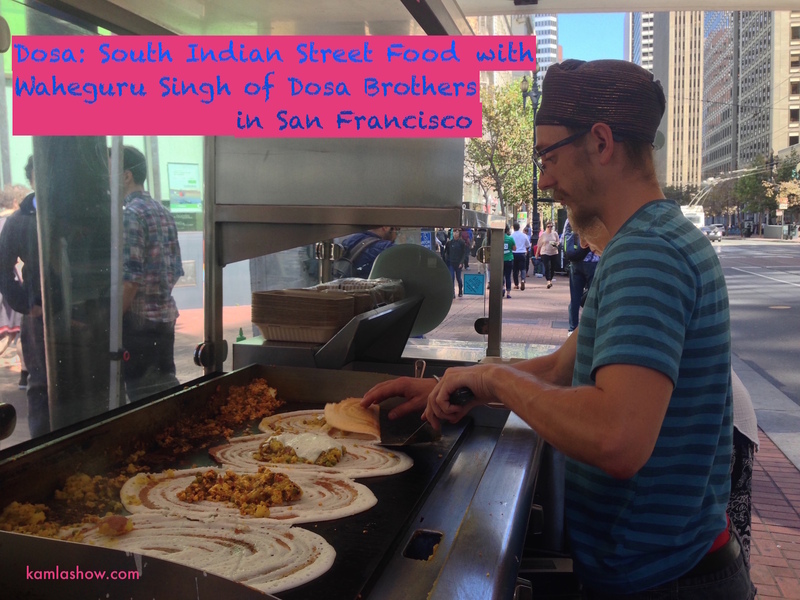 I wanted to rush and find out all about Dosa Brothers and how Waheguru Khalsa came to serve South Indian Street Food in the heart of San Francisco. Khalsa was busy talking on the phone, so I turned to Tsering, who was waiting to pick up her dosa to find out how she discovered this place? Turns out that she found out about Dosa Brothers from her colleagues at work. Tsering is originally from the Southern state of Karnataka, and anytime she has a hankering for South Indian food she lands up at Dosa Brothers. Khalsa it turns out discovered dosas while studying in Amritsar in Punjab, India. About 5 years ago he started his dosa business in Colorado. A couple of years ago he moved to San Francisco. He started Dosa Brothers in San Francisco last year and now has multiple food stands in the city. Like me, quite a few people are pleasantly surprised to discover his food stand. Sometimes Indian travelers arrive start from the airport to his food stand. You see his food stand is right outside Mongomery BART station in San Francisco. Here is the backstory of how an American came to serve a popular South Indian street food in San Francisco. In my two decades in the San Francisco Bay area I have never ever seen a dosa vendor in downtown San Francisco. Well, there are a couple of dosa trucks, but I had not seen that All-American street food vendor selling dosas. You typically have to go a restaurant to eat dosas or curry favor from a friend, who can whip out these tasty,crispy and addictive dish. Clearly, you can see that I am totally in love with dosas. What are dosas you ask? They are an Indian crepe version made of rice and lentils and are served plain or with some kind of a filling and chutney and sambar, a lentil soup. Think of dosas as the Indian equivalent of hamburger and fries. I will bet my bottom dollar that dosas rank as one of the top favorite dishes for Indians. Here is a video interview with Khalsa. I did not know what to expect from The Intern. Like most of you I saw a trailer and then De Niro’s appearance on Jimmy Fallon’s show, where he barely spoke about the film. In The Intern Meyers introduces a clever twist in her narrative. She plants a genial, retired senior executive as an intern in a fast paced startup and then sits back and sees what happens when these two different worlds meet. They have different outlooks, values, and expectations. So, will their views collide, or will they learn from each other? Retired executive Robert Whitaker (De Niro) is finding it difficult with all that free time at his disposal. He is itching to do something meaningful and lands an internship at an e-commerce startup in Brooklyn. He is assigned to Jules Ostin (Anne Hathaway), the hands-on founder of the startup. Ostin is a stickler for details and works long hours and barely sleeps. Naturally, there is no time for her to deal with an intern and that too a senior one, who worked for a phone book company. So, how could this senior intern possibly know anything about an online startup world and online shopping? By putting two different generations of people under one roof we see some interesting developments. We see the contrast in attitude between the baby boomers and millennials on work, life, marriage and dating issues. The millennials seem to be struggling a bit, especially the men. We were told we could become anything we want says Hathaway at one point in the film. She has everything going for her: a dream job and a house husband, who takes care of their daughter. “But, what happened to men?” she wonders. When did they go from being men to boys? And guess who inspires the boys in Hathaway’s startup? The affable and impeccably turned out De Niro. Meyers skillfully handles and highlights the difference between the two generations and what they can learn from each other. More importantly, she underscores how technology has changed our lives. And then there is the fact that the senior intern sets everything right for the people in the film. Turns out he had a lot to offer to the young millennials at the startup. Like I said I enjoyed watching the film since I could identify with both the world views. I grew up in a world where we used phone books, landlines and went to a brick and mortar shop. Today, we live in a world of instant contacts, where we barely speak to each other. Like many of you I saw what we have lost and what we have gained in our transition from a pre-Internet to an always-connected world on the Internet. Has India’s time come? What will it take to unlock India’s economic potential? “The solutions are known, the paths are known but can we quickly decide and execute on them? That is the challenge for India,” says Dr. Pramath Sinha, who is co-founder of Ashoka University and Indian School of Business, CEO of 9.9 Media and Senior Counselor at Alrbright Stonebridge Group. Dr. Singh was the man, who unschackled India from its social framework over 24 years ago. Dr. Singh was also the Prime Minister, who declared at a state dinner hosted by President Obama in Washington DC that India’s time has come. “The promise has always been there, the delivery always been short of the promise,” explains Dr. Sinha. Could India’s current Prime Minister Narendra Modi help unlock India’s economic potential? Prime Minister Modi is putting the right building blocks and trying to revive the economic growth side, while not letting go off the development agenda points out Dr. Sinha. We also spoke with Dr. Sinha about his interest in education and what led him and his team to found a new liberal arts college modelled after a 4-year American college system. Tune it to find out what he has to say. Meet Geeta V. Patel, who directed and wrote Meet The Patels a documentary about one family’s quest fo find a suitable bride for their son. Beta, you have to get married is what Geeta’s parents tell Ravi, her sibling, who had just turned 30. Crisis, crisis, crisis is what I was thinking says Geeta. In Meet The Patels we see how one family deals with this crisis, and how in the process they learn to love and respect each other and be “a better family and better individuals,” says Geeta. Before their family trip to India Ravi had gone through a break-up that his parents did not know about, but Geeta did. Their parents worry Ravi is getting old and still single. This, by the way, is a big deal in the Indian American community. Settling down is the “big” question for anyone who is in their 20’s and if you are in your 30’s you are definitely in code red and the family is in one big crisis mode. How do we get our child married is the questions that haunts them 24/7. The Patel family was definitely in code red zone as Geeta puts it. Once Ravi agrees to his parents suggestion to go the tried and tested arranged marriage process, we get to see how the Patel family goes about networking and pitching biodata after biodata to find the right match. This is a candid and intimate film where we see the parents Vasant and Champa pitch in and compile “biodata” of suitable girls and Ravi then spends time meeting these suitable girls and to find that elusive “life partner.” Ravi comes up with the idea of documenting this challenge to find a suitable partner to his sister and that is how the film is born. Finding a partner is a challenge not just for Ravi, but for many young people within the Indian American community in the USA. Oh! Did I mention that Ravi is an actor and stand-up comedian? He co-directed the film with Geeta. Ravi is part of the new TV series Grandfathered. 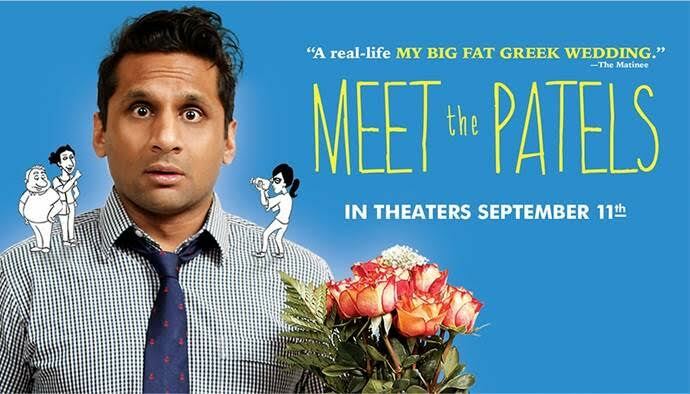 While the film is funny and delightful it is also filled with honesty and underscores the challenges that many young Indian Americans have in finding the right partner. The film raises quite a few pertinent questions on marriage and why divorce rates are high in the US given that many choose their own partners as Geeta points out. Their parents went through the arranged marriage route and are happily married. How come Ravi is not able to go that same route and find his share of happiness? Why do arranged marriages work and how come such couples stay happily married is one of the central questions Geeta and her sibling Ravi explore in the film in a very touching and senistive manner. At the heart this film is about love. Besides the making of Meet The Patels, we also spoke with Geeta about her work with the Wachoskwi siblings. She worked with them on Sense8, a Netflix production. 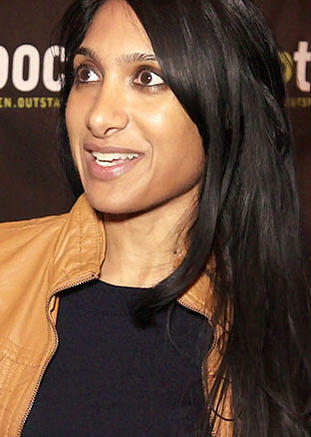 Geeta is currently working on a produciton called Mouse with Grant Hill, who produced The Tree of Life and Matrix. I kept missing the various screenings of East Side Sushi in San Francisco Bay area. The film screened at the 2014 Cinequest Film Festival and I marked it as “must-watch” film, but never got around to watching it. It won the audience award at Cinequest. The film then screened at CAAMFest and I missed that screening too. Finally, I got to see the film earlier this month and really enjoyed it. East Side Sushi is the story of a quiet and determined woman, who wants to become a shushi chef. The trouble is most sushi chefs tend to be men and therein lies the tension. This is not a film filled with loud emotions and heated dialog. Instead this is a film with strong and determined emotions, where the points are made in a quiet and understated manner. That, I think, is a refreshing approach. Anthony Lucero wrote and directed East Side Sushi and filmed it in Oakland. Juana (Diana Elizabeth Torres) is a single Latina mother, who lives with her father (Rodrigo Duarte Clark) and her young daughter. Juana and her father eek out a living selling food from a food cart. Determined to improve things for her daughter and herself Juana applies for a job at a local Japanese restaurant. She hits it off the chef Aki (Yukata Takeuchi), who discovers she has all the ingredients of a good cook: great knife skills and a multi-tasker, who works without complaining under pressure. Juana is not particularly fond of Japanese cuisine, but under the gentle guidance of Aki she discovers the complexity of Japanese food and learns to enjoy it. She starts to pack leftovers so that her family can enjoy her new found discovery of Japanese food. That experiment fails initially, and then her family learns to enjoy Japanese food. As her interest in Japanese food deepens, Juana is drawn deeper into the world of sushi. With quiet determination she starts to master the craft of making sushi and helps out Aki when the restaurant gets busy. But, there is a catch. Women are not allowed to stand in the sushi bar and roll out sushi, and the owner of the restaurant is aghast that Juana is being allowed to make sushis for his customers. He banishes her to the kitchen and forbids her from making any sushi. Aki tries to makes a case with the owner that Juana is an excellent sushi chef, but his words fall on deaf ears. At first it looks like Juana goes along with the owner’s decision. And then she decides to stands up for her rights to become a sushi chef and makes a case to the owner. The owner is a traditionalist, who does not believe in women sushi chefs. When he does not budge, Juana quits. Undeterred by her restaurant experience, Juana decides to join a sushi competition. She, of course, is the only woman in the sushi competition. To find out what happens next and if Juana realizes her dream of becoming a sushi chef you have to watch East Side Sushi. East Side Sushi is a gentle and undemanding film, and Lucero manages to keep your interest. Torres’ portrayal of Juana as a quiet and determined woman is very convincing. I enjoyed watching East Side Sushi and the fact that this is a local film was an additional bonus. What is the current status of US-India relations especially when it comes to business and joint venture opportunities in India? We spoke with Mara M. Burr, who is the Senior Vice President at Albright Stonebridge Group in Washington DC. She joined the company in 2014 when Richard Verma left the group to become the American Ambassador to India. In this interview we spoke to Burr bout US-India relationship. How has the relationship changed and what are the business opporunities? What else needs to be done by the current Indian government to make it easy to do business in India. Prime Minister Narendra Modi has ushered in a new set of reforms and Make in India campaign Burr explains. These reforms are pro-India and pro-business she adds. Tune in to find out what else she has to say on doing business in India. Besides US-India relations, we spoke to her about women and if they negotiate differently. Burr made some very interesting points on how women negotiate. We also spoke to her about growing up in Minnesota and people that influenced and inspired her. One of them was a priest, who inspired her to become a lawyer. Burr has 18 years of experience as a negotiator in international trade and investment areas. From 2004-2010 she served as Deputy Assistant US Trade Representative for environment and national resources. Prior to that she practiced trade law. I got an opportunity to interview Anker and Chin in San Francisco. My mind was a bubbling with questions and I curious to find out about their fascination and pull towards mountains and mountain climbing? Why do they climb mountains was a question that led us to other questions on how they prepare for their journey, why do they speak in such quiet tones, how did they film and climb? What is the role of mentor in the world of mountaineering? Now that they have realized their dream of climbing Meru, what else do they plan to do? Tune in to find out what Anker and Chin had to share. Meru is currently showing in theaters in the San Francisco Bay area. You know about best laid plans, right? They never go as expected. About 3 weeks ago my prescription reading glasses broke into two and that put me out of commission for a couple of weeks. Just as I got my new pair of glasses, my not-so-old Mac decided to act up and I had to turn it in to be fixed. It will be a few days before I get my trusty Mac back. I am behind in my blog posts, but my weekly TV interviews are up on my YouTube channel. Every week you will find one new interview on my YouTube channel. My weekly podcasts should be back up in a few days time. And, you can follow me on Twitter. This month marks the third anniversary of my TV show where we feature interviews and conversation with entrepreneurs, technologists, filmmakers and other news from the San Francisco Bay area. The TV show’s goal is to is to connect the various communities of the Bay area through stories and showcase the diversity of the area. I spent more than 3 years preparing for my TV show. I first spent a year taking classes and completing a certification on TV and Radio production and editing. I got a jump start on my radio show, which I still do every week. But, I spent a lot of time trying to muster courage to start my TV show. We did a bunch of dry runs in the studio to figure out the format of the show and how to organize the show. Even after all that initial preparation I was very nervous if we could pull this off. We pulled it off with a lot of help from so many, many people. The first show to air three years ago was an interview with filmmaker Nicolas Jarecki about his debut film Arbitrage starring Richard Gere, Susan Sarandon, Brit Marling and others. I vividly recollect getting up at 4.30 am to get ready, pick up the camera person and drive to San Francisco for the interview. We had 15 minutes to record our interview. Jarecki was wonderful when I explained to him he was the first person I was interviewing for my new TV show. He was making his debut as a director of a feature film, and here I was making my debut on TV. The interview with Jarecki aired on a couple of channels in Silicon Valley on a weekly basis. We started wtih one interview every two weeks, and slowly ramped up to a weekly show. During the process we learned to iron out many, many wrinkles and get a process in place. Shooting in the studio was infinitely easier since we did a live-to-tape show. Generally, live-to-tape shows require minimum editing and that is a huge plus when you are producing a weekly show on a slim budget. But, these studio interviews require a lot of organization nd prep work. Shooting outside the studio is a bit easier, but a lot more challenging when it comes to editing and assembling a half hour show. Today, the TV show airs in many markets in San Francisco Bay area and a couple of markets on the East Coast. Creating a weekly TV show requires a lot of help and support from many, many people. There are so many people behind the scenes, who have helped, supported and encouraged me in my journey. There are crew members, editors, hair dresses, make-up artists and all the wonderful people at various TV stations where the show airs. A special mention to all the PR folks, who helped with the interviews. This show would not be possible were it not for all these people, whom you don’t get to see. And a big thank you to my husband for his help and support. All the show area available on my YouTube channel. It will be wonderful if you can show your support by susbcribing to our YouTube channel. Thank you for your help, support and encouragement. I truly value it.